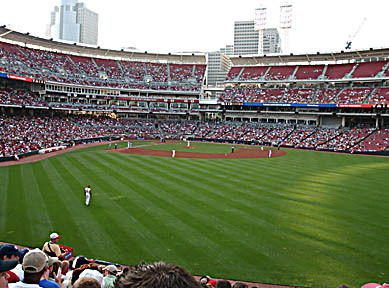 The Indianapolis Association of Wabash Men (IAWM) and the Greater Cincinnati Association of Wabash Men (GCAWM) jointly visited the Great American Ball Park in Cincinnati on June 10, 2005. The group watched some big names – Sammy Sosa, Ken Griffey, Jr., B.J. Surhoof and Rafael Palmeiro – as the Cincinnati Reds dropped a 4-3 decision to the division-leading Baltimore Orioles. I have to tell you, it seemed very odd to see Sammy Sosa in something other than a Cubs uniform! Lee Clark ’73 organized the bus trip from Indianapolis – he was joined by IAWM president Brad Johnson ’71 and several IAWM board members. Lee reports the bus was nearly full with almost 40 alumni, family, and friends. The "Hoosiers" linked up with a smaller group from Cincinnati, led that night by Roger Billings ’59, in the right field stands. The seats were excellent, offering a great view of the entire ball park with the Cincinnati skyline in the background. The Great American Ball Park is brand new and quite an upgrade! Many thanks go to Mark Sutton ’92, who organized the Cincinnati group, and to Lee Clark for a great Wabash evening.